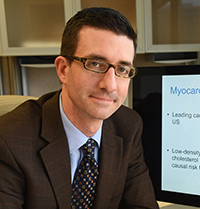 Nathan O. Stitziel, MD, PhD, and his colleagues have shown that mutations in the NPC1L1 gene may protect against high LDL cholesterol and heart attack. Among medications that lower cholesterol, ezetimibe is not in the widely prescribed class of drugs called statins, which stop the body from manufacturing its own cholesterol. Instead, ezetimibe blocks dietary cholesterol absorption in the gut by inhibiting the NPC1L1 protein, perhaps approximating the effect of having only one working copy of the NPC1L1 gene. This work was supported by funding from the National Heart, Lung and Blood Institute (NHLBI) and the National Human Genome Research Institute (NHGRI) of the National Institutes of Health (NIH), grant numbers K08HL114642, T32HL007208, R01HL107816, RC2HL102926, RC2HL102925 and 5U54HG003067-11, and by a grant from the Foundation for Barnes-Jewish Hospital, a Banting Fellowship from the Canadian Institutes of Health Research, a grant from the Donovan Family Foundation, an investigator-initiated research grant from Merck, and a grant from Fondation Leducq. Stitziel NO, et al. for the Myocardial Infarction Genetics Consortium. Inactivating mutations in NPC1L1 and protection from coronary heart disease. The New England Journal of Medicine. Nov. 12, 2014.